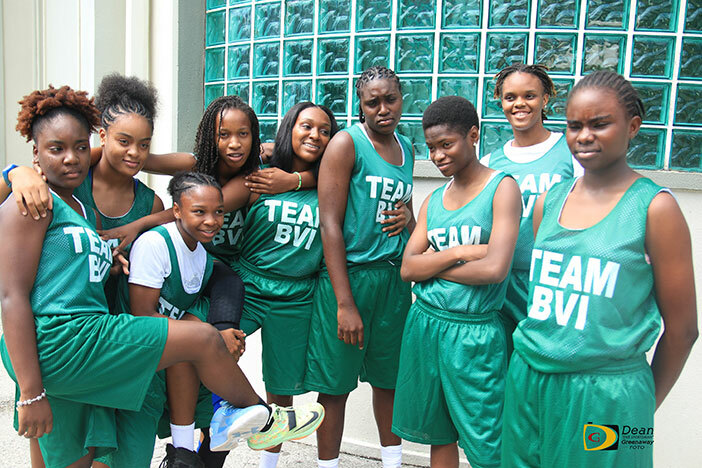 The BVI team got off to a rocky start in its Centrobasket Women U17 Tournament debut in Aguada, Puerto Rico, never recovered and lost all their games, but walked away with a lesson learned. Shauliqua Fahie had 23 points and 14 rebounds and Mahkyla Pickering followed up with 17 points and 10 boards, but it wasn’t enough as El Salvador routed the BVI 101-54, during Group A, in the tournament opener for both teams. El Salvador took control in the first quarter, constructed a 25-10 lead, never let the BVI back into the game and led by as much as 47 points. El Salvador’s game dominance showed in key areas where they outscored the BVI–35-16 on fast breaks; 29-7 in steals; 36-4 in assists. The BVI turned the ball over 44 times to El Salvador’s 15. The BVI bested El Salvador from the 3 points line, shooting at 58% to El Salvador’s 20 and 50% to 20% from 3 points range. In their next game, the BVI started off just as they did against El Salvador and fell behind Guatemala 26-6 in the first quarter then lost 98-35 after trailing 43-17 at halftime. The BVI had 52 turnovers to Guatemala’s 14 and Guatemala led by as much as 65 points. Fahie was again the leading scorer with with 14 points. She also had 11 rebounds. Pickering and Keithrece Smith added six points each. Their woes continued with a lopsided loss to Mexico, who shut them down in the second. Just as in its games with El Salvador and Guatemala, the BVI found themselves trailing the Mexicans from the early part of the game to lead 29-11 at the half. Mexico led 57-20 at the break. 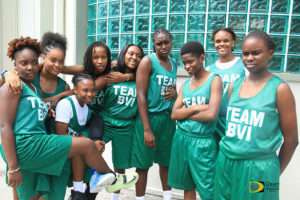 They outscored the BVI 53-9 in the second half during a 110-29 triumph. For the third straight game, turnovers dogged the BVI, who committed 44 to Mexico’s 9 and the Mexicans capitalized with 47 points off turnovers. The BVI showed improvement on the defensive rebound with Mexico holding a 31-30 edge but Mexico dominated on the offensive rebounds, 33-10. As the tournament progress, the fatigue is taking a toll on the BVI. Captain Fahie had the BVI’s top score of nine points. She also had nine rebounds and three assists. Pickering added eight points with four rebounds and Smith dropped in five points. In their next outing, the Bahamas fended off the BVI 79-60. The Bahamas broke opened a close game that was 8-7 in their favor at the five minute mark, by using a 19-2 run to end the first quarter and went up, 27-9. Using a man to man defense, the BVI had their best quarter of the tournament when they outscored the Bahamas 13-7, to pull within 34-22 at the half. Fahie yet again, had the BVI’s top score with 23 points and 12 rebounds. Keneyna Penn added a 13 points 11 rebounds double double, while Smith finished with 11 points and eight rebounds. “We didn’t have aggressive play, they played scared and ended up with careless turnovers and missing layups,” Scatliffe surmised the overall team performance. While turnovers continued to dog the team, the BVI cut their average in half to 21 compared to the Bahamas’ 17. They also improved on the number of steals, getting over 10 for the first time and finished with 11. In their finale, Suriname outscored the BVI 46-13 in the second half en route to an 86-41 victory. Suriname ended the game with a 21-4 fourth quarter run, to put the game to bed. Before the wheels began falling off, the BVI had their best showing in the tournament trailing Suriname by just three points, 16-13 at the end of the first quarter. However, their fitness became a determining factor in the end result as the tournament progressed. Turnovers had been a problem hampering the team. They had 51 and Suriname scored 45 of their points off BVI turnovers. The BVI held a two points lead for just eight seconds very early in the game and Suriname enjoyed its largest lead of 45 points. Fahie who top scored in every game, finished with 19 points and 11 rebounds to go with four assists. Keithrece Smith added 10 points and four rebounds. Ambah Penn pulled 10 of her game high 13 rebounds on the defensive end and added three points to the tally. Despite losing all their games by lopsided scores, Scatliffe said it was a lesson for the Centrobasket debutants that will help them in the future. Fahie said while it was a good tournament, all the teams were quicker than the BVI. The reason for the high number of turnovers she said was simple. Fahie said they now understand that they have to take practices seriously and try to get in better shape so that other teams won’t overrun them. What was the team’s sentiments after the tournament?